Though Patrick has not yet released the details of his proposed bill, it’s likely modeled at least somewhat after HB2—he has issued vocal, official support of the oppressive bathroom bill in the past—and, as in North Carolina, will likely do nothing to protect cis “women and girls,” and everything to further endanger trans lives. As the Guardian reports, over the weekend a federal judge in Texas granted an injunction against Obama’s efforts to protect trans individuals from discrimination in hospitals and from doctors, which the publication says could “embolden” Patrick’s efforts, as well as other state-level anti-trans legislation around the country. And, reports the Guardian, this threat comes amid several other anti-LGBTQ bills filed in the state of Texas, and up for a vote this month. One would eliminate local non-discrimination ordinances if they have protections that go beyond state law – reminiscent of HB2. 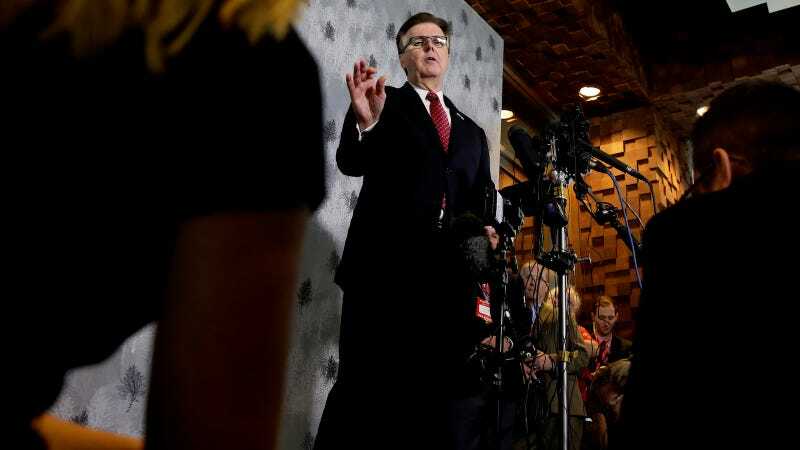 Another calls on the state not to enforce federal laws that the Texas legislature deems to violate the state constitution – which since 2005 has defined marriage as between a man and a woman. A high-profile revision of the law on a parent’s right to know information about their child has raised fears that it could force teachers to out students. “If you just look at North Carolina and Indiana and put that over a Texas-sized footprint of our economy, it could be up to $8.5bn and 185,000 jobs lost, it is very dramatic,” said Chris Wallace, the association’s president. “We want to remain one of the top states in which to do business, so why would we want to do anything to risk any of that, by legislation that’s really unnecessary and unenforceable? “The question of how you would enforce people going into the right bathroom…What, so you have to take your birth certificate? It gets really tricky. Excellent point! And it brings up a key tension that will likely define Republican choices over the next four years: will they be willing to cut off their noses to spite their faces?